Well this will never be a dead mall, The Mall looks nothing like these photos (it's bigger by say several football fields), It's really a useless mall, the food court is so~so, no arcades and most of all if you don't fit in (dress in overpriced cloths ie) security will hound you all the time. So be white, very wealthy and act smug because thats the only way you'll enjoy it there. I prefer carolina place myself! People are always getting mugged and car jacked there which is ironic it being in the nice side of town. The malls biggest anchor store to my knowledge is and forgive the spelling nordstram And I think there is a macies there now as well. With all due respect to moose's comments, I wholheartedly disagree with his assesment of SouthPark. Also, the stores aren't any more overpriced than any other mall. They have a different level of stores that the typical mall, but it's no higher when you compare apples to apples. The largest anchor store at SouthPark is Belk. Nordstrom is actually the second-smallest in the mall, just above Neiman-Marcus. How could anybody prefer Carolina Place? Other than the main hallway's curving skylight, there is no "there." Looks like they had water in the center court during its first decade or so. In 1976 there's no more water around the fountain. I personally like water and plants in malls. The coolest one has to be "The Mill" which had a realistic creek with lots of plants - and a old mill, of course in the mall center court. Almost makes you feel like you are outside. Any plans on sharing some photos of this mall, Keith? It's gone now btw. The early photo of the fountain being built is classic! Love it. And hey, you have a legal right to take photos in a mall. In fact, you can take a picture of anything or anyone you want, legally. As long as you don't use the photo for financial gain (such as, sell it for money). I, too, have been busted for HOLDING my camera. Totally rediculous. I'm a 130 lb weakling holding a camera towards Macy's. They claimed I was a terrorist. Actually, what you can and can't do at a mall is a legal gray area, since it's a public forum that is privately owned. The PruneYard Shopping Center Supreme Court decision allows essentially allows states to enact laws protecting free speech on private shopping center property. After the decision, the California State Assembly passed a law that allows free speech with limited restrictions in parts of shopping centers normally open to the public. All that said, I've been known to take pictures inside malls myself, but I'm pretty discreet and know I wouldn't have a legal leg to stand on if they asked me to stop. 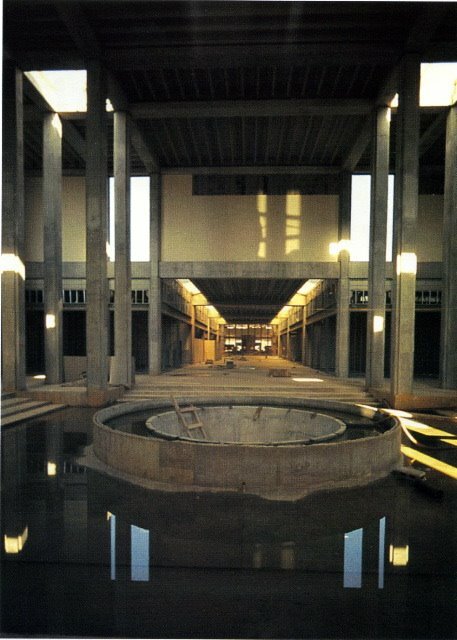 As much as the bowl here looks different, I wonder whether during construction, rain fell in the uncovered skylight holes and filled up the courtyard, and someone thought it looked pretty and snapped a photo. I'm unsure on the fountain, too - the one in Winter Park Mall has water falling in streams, from notches in the rim of the upper basin (I'd bet money that the basin isn't full of water, it simply has a trough around the outer edge) but these streams look too vertical and too perfect. I wonder if it's a water curtain. 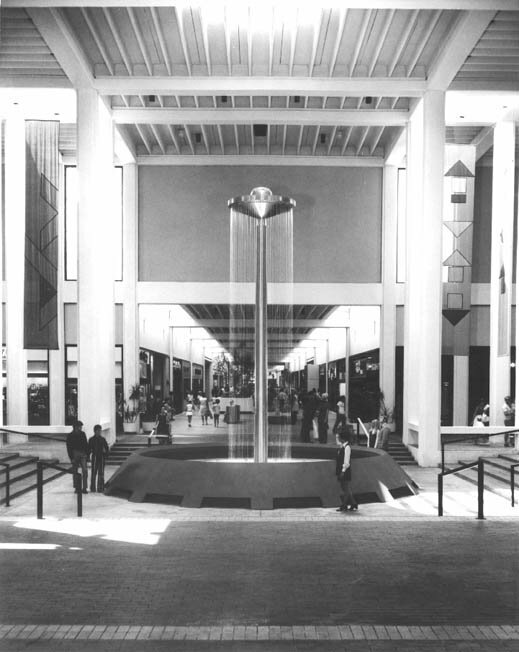 Water curtains have been shown in other mall photos here - some were cylinders of various sizes (with blacklights in the planter to make the fluorescent dye-tinted water glow) and one, in a Florida mall, forms a conical shape. They're approx. 1/4" dia. flexible clear (plastic?) lines strung between a water source and a pool. The lower ends are kept separated by a plastic spacer bar with slots cut in it, and metal weights, held by a knot tied in the line or "lace", keeps them taut. Water sheets down them, looking like a sleeker version of an oil-filled raindrop lamp. they're still made today, though I'm not sure where one can be seen - PEM Fountain of Canada makes parts to assemble them, though.